America’s shortage of skilled welders means big opportunities. It affects virtually everyone, every day. It’s around us everywhere. It’s in our homes, our cars, public transportation, our places of work, the roads we drive, and countless other places. Without it, everyday life would be dramatically different than it is today. We’re talking about the work of welders. It’s something most people don’t really ever think about. But if you were to consider all of the ways that welding and the work of welders impacts everyday life in the U.S., you’d probably be amazed. Can you name another line of work that happens at the bottom of the ocean, in outer space, and everywhere in between? Welding does. The fact that it is done at the bottom of the ocean and in outer space isn’t the only distinctive aspect of welding. Because of the vast presence it plays in so many different industries all over the world, welding also happens to be one of the few professions that is virtually always thriving and growing. First let’s take a look at the field itself—where it came from, how it’s evolved, and where it’s headed. Welding is a fabrication process that uses very high heat to fuse two pieces of metal together for the purpose of creating something with function. You can trace welding’s roots all the way back to the Bronze Age, 3,500 B.C. Crazy, but true. There were actually pictures of ancient welders and their tools drawn inside Egyptian tombs. Obviously, things have come a long way since then. It was in 1969 when welding was first attempted in outer space. More recently, welding was critical in order to complete the International Space Station. And during World War II, President Franklin D. Roosevelt marveled at new welding techniques that helped the United States build warships at an unequaled pace. So, what about welding today? No matter what kind of welding you may find yourself doing, it’s important to keep in mind that it can be a physically demanding career. Simply by the nature of the field, welders work in hot, physically taxing environments and need to have physical strength and endurance, as well as good dexterity and hand-eye coordination. And for those who are up for the challenge, welding delivers outstanding career opportunities in terms of the variety of settings, income potential, and the possibility to travel the world. Probably the biggest reason there is so much opportunity currently for welders is the fact that the industry is in the midst of a welder shortage. 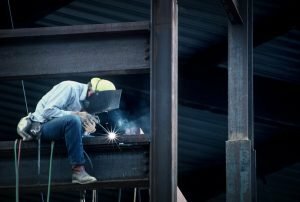 Anywhere you look with regard to the welding profession, you’ll likely come across reports of the shortage of welders that’s facing the American economy. Skilled Welder Shortage Looms in U.S. In fact, according to the American Welding Society, the U.S. will be faced with a shortage of more than 400,000 professional welders by the year 2025. And according to O*Net Online, Pennsylvania will see a projected growth in the need for welders of 6 percent between 2014 and 2024. There are a lot of factors contributing to this shortage. An Aging Infrastructure—roads, bridges, airports, rail, water supplies, and energy all are in need of renovating and rebuilding, and the work of welders will be a central aspect to the massive amount of work that will go into rebuilding America’s infrastructure. A Surge in Retirees—as more and more welding professionals near and reach the age of retirement, a vacuum in the welding field will be created that will need to be filled. It will take an increasing number of younger workers to fill that gap. Increasing Needs of the Energy Industry—with an increasing number of pipelines that are planned or currently in construction that stretch across massive lengths of the U.S., and even from Canada to the southern part of the U.S., more welders will be needed to fulfill those projects. And regarding the surge of welders nearing retirement, the American Welding Society estimates that the average age for welders in the U.S. is 57. As physically demanding a profession as welding is, that’s more evidence that a huge number of welders will retire soon. Needless to say, with all of these forces hitting the U.S. economy at the same time, the need for skilled, well-trained professional welders isn’t going anywhere anytime soon. It could mean lots of things. The simple truth is the welding profession desperately needs more young people to seek high-quality education and training to enter the field. And it also needs to see an uptick in the number of women entering the field. Along with all of the growth, another thing to consider for anyone thinking about taking advantage of these opportunities is income. According to O*Net Online, the median annual salary for welders, cutters, solderers, and brazers in Pennsylvania is $39,690—a figure that tops the national average. Keep in mind that this is median salary, and that initial salary will certainly be lower. And welding is a field with a huge salary range depending on experience, the type of welding being done, and where in the world you may find yourself working. Additionally, as a welder, you’ll find yourself working in any number of professional settings. That’s one of the attractive aspects of the field—flexibility. Welding is essential to so many industries, the possibilities really do seem endless. Even as the world shifts to green technology and more environmentally responsible practices, welders will remain a major part of so many industries. The perpetual need for energy, infrastructure, and defense solidifies the fact that welders will always be needed. Here’s how you can take advantage of such abundant opportunities. Find a top-notch education and training program. More good news for you is the fact that entering the field of welding doesn’t take a four-year college degree. You can find high-quality programs that provide excellent instruction and preparation for entry into the field in as little as 12 months. Accreditation—this signifies that the school and program has achieved a certain threshold in terms of academic quality in the eyes of an authoritative body or organization. In order to gain and maintain accreditation schools must meet specific standards and undergo periodic reviews. Modern facilities—you’ll want to have a good idea of the type of equipment and learning resources the program has to offer and make sure it mirrors what you’ll be using in a professional setting. Experienced faculty—who is instructing you is absolutely vital to the quality of your experience, so make sure the instructors are seasoned professionals who have worked in the welding industry. Current and relevant curriculum—find a program that shapes its curriculum with input from industry professionals so you know that what you’re learning are the skills most valued by employers. One of the most important aspects of any education and training program in welding is that it provides an abundance of hands-on training experiences. Along with equipment and facilities that offer similar settings to what you will find on the job in the professional world, high-quality programs also will have you perform in real-world scenarios to give you the most applicable, relevant training possible. With the skilled welder shortage throughout the country and opportunities that situation presents, the Welding Technology program at Penn Commercial could present an ideal path to a new career for today’s workers. And at the same time, the Penn Commercial Welding Technology program can help meet the needs of a state, nation, and an economy that needs more and more skilled welders in order to continue moving ahead.